The European Political Strategy Centre (EPSC) is the European Commission’s in-house think tank, established in November 2014 by European Commission President Jean-Claude Juncker, and operating directly under his authority1. Tasked with a mission to innovate and disrupt, the EPSC provides the President and the College of Commissioners with strategic, evidence-based analysis and forward-looking policy advice. Among its responsibilities, the EPSC has a mandate to engage in foresight and anticipatory governance, spearheading the European Commission’s involvement in the European Strategy and Policy Analysis System (ESPAS) – the EU inter-institutional collaboration that aims to build preparedness for upcoming challenges and opportunities. The EPSC also seeks to facilitate communication and outreach with decision-makers, think tanks and civil society at large. Under the leadership of Ann Mettler (Head)2, Paweł Świeboda (Deputy Head) and Mihnea Motoc (Deputy Head) – and powered by its highly versatile and experienced team – the EPSC provides a unique space within the European Commission for conducting interdisciplinary research, collaborative projects and organising thought-provoking seminars and events. The EPSC staff combines a unique set of perspectives and skills: public and private sector experience, data visualisation and design, financial expertise and legal advice, social media savviness and political acumen. In January 2018 and 2019, the EPSC was listed in the top ten global 'best government-affiliated think tanks' by the Think Tanks & Civil Societies Programme (TTCSP) of the University of Pennsylvania, in its prestigious ‘Global Go To Think Tank Index’, which covers over 6,800 think tanks. In a previous edition of the index, the EPSC was awarded the title of ‘Best New Think Tank 2016’. 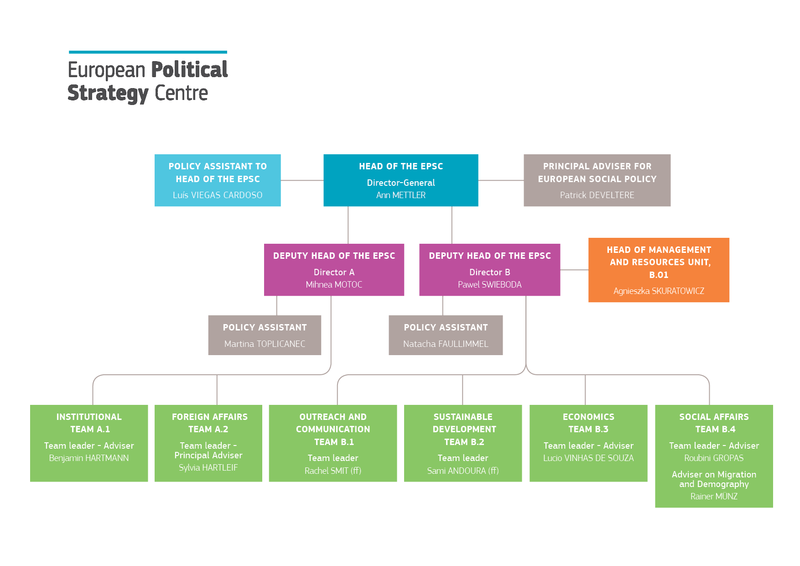 In accordance with the Communication (C(2014) 9001 final) of 6 November 2014 from the President to the Commission on the European Political Strategy Centre: Mission, Tasks and Organisation Chart. See the list of meetings held by Ann Mettler, published in accordance with Commission Decision (2014/838/EU, Euratom) of 25 November 2014 on the publication of information on meetings held between Directors-General of the Commission and organisations or self-employed individuals, OJ L 343, 28/11/2014.